Jules B has been dressing stylish men and women for over 25 years. Since opening their first store in Jesmond just outside the city centre of Newcastle upon Tyne in1984, husband and wife team Julian and Rhona Blades have opened more stores in the North East of England, North Yorkshire and Kendal in the picturesque Lake District. All of the stores have become prestigious shopping destinations, catering for an elite clientele of fashion devotees and stock an impressive collection from world renowned designers including Vivienne Westwood, Alexander McQueen, M Missoni, Helmut Lang & Alexander Wang. Awarded Drapers Magazine coveted title of ‘Best Independent Fashion Store’ an impressive four times, the retailer continues to succeed where others have failed. 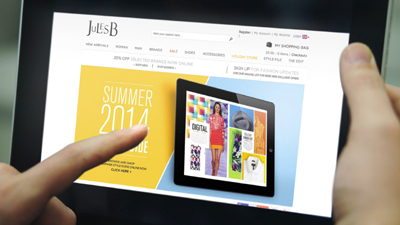 Jules B’s early investment in its website, when many fashion retailers were hesitating to move forward with e-commerce, has underpinned the success of the business. IT investment is core to the company’s business and it has recently invested in a fully integrated stock management and head office solution from Eurostop to support its sales operations in store and online. Customers can now find the complete range of designer clothing and accessories brands from all its stores under one virtual roof, with deliveries made across the globe including the UK, Europe, North America. 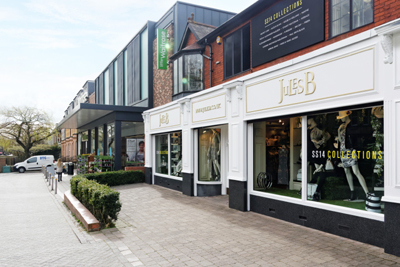 At the heart of Jules B ethos is attention to detail and customer service – from brand selection, to store interiors and the online shopping experience. Eurostop’s e-fulfilment module underpins the success of the stock management for Jules B and enables the retailer to manage where the stock is obtained to fulfil online customer orders. The system decides if the order is fulfilled either from the branch stock or warehouse based on different criteria set at Head Office. Jules B benefits from having a view of its live stock position in the warehouse and shops to efficiently fulfil web orders and optimise stock turnover. The system prioritises each e-commerce order as it arrives, and either auto generate picks for the warehouse if it finds the stock in the warehouse or elects to take the stock from the stores. If the store is chosen, the system automatically alerts the store e-pos system that it has the items requested in stock so that e-commerce orders are prioritised. Tom Jeffrey explains; “There are two key elements to the way we use the Eurostop system that has really helped us to manage stock efficiently across all channels. The first is fully automated fulfilment across the business enabling web orders to be automatically sourced from the most stock rich locations. It takes into account the consolidation of goods ensuring that orders are all dispatched from one branch. Automating the fulfilment process has also enabled Jules B to move staff from working on ‘virtual tills’ and train them to take on other roles within the company, improving both morale and increasing opportunities for staff development. “As the reputation of Jules B grew and consequently our online business flourished, so we needed a fully integrated system to manage all our sales and stock to run the business. Simply taking on more staff to manage fulfilment was not sustainable. Scanning items and automating processes is a much more efficient way to work – it eliminates the monotonous tasks, reduces human error and provides much greater job satisfaction. Through staff redeployment and development we estimate that our return on investment will be met easily within two years,” said Jeffrey. Jules B has also invested in powerful reporting to support its buyers. As well as providing the standard information – margin, sales by style, size, colour, location, Eurostop’s e-cubes reporting enables much more detailed analysis, for example, calculating sell through over time. It also enables them to analyse information like purchase orders outstanding, which enables more efficient stock management.